Regretfully I cannot recall the origin of the statement and apologise for not crediting the quote but it has been a significant focus in my life. 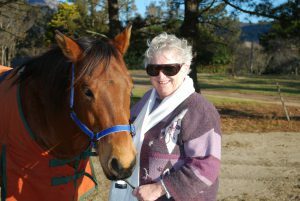 Hence my ministry has taken me to outback cattle stations in Queensland and NSW ( including Winton, Alpha, Charters Towers, Mt Hope, and Ivanhoe) especially when the family was under pressure due to illness, a new baby or tragedy in some form. My role here was to teach the children and help maintain some balance in difficult situations. It brought me into contact with issues of isolated families and was a great eye-opener. Few of us really appreciate the challenges of life in Outback Australia. I remember at the time of my first placement, Sr Jean Marie sent me $5 so I could buy a coffee. I had to gently explain that I would need to drive 300 kms to buy a coffee. The next time, she sent me a nice tea bag. The difficulties of obtaining supplies, support, and a helping hand are very real. The hours of driving to camps or to visit family members at boarding school create a weariness, that is hard to describe but it is one the families know they have to endure if their children are to have any education, social contacts or sporting experiences. My ministry also took me to the Barkly area in the NT to an aboriginal school at a time when the whole community there were suffering from tragic events which had taken place and help was needed. Another situation at an outback hotel was especially challenging as the first morning when I awoke, I found an ambulance at the door about to take the mother to hospital! She had a serious medical condition but recovered well. Another time, I was awoken at 6am and asked could I pack up the children as a baby was on the way and we had to make a five hour trip to Townsville. Two cars went that time, Mum and Dad in one with the birthing kit and myself, the children and the grandmother (who was deaf) in the other car. We had planned to go a week later and were booked in at a motel but baby had other plans! Thankfully all went well and a healthy boy arrived at 2 pm. I was also involved as a volunteer in Sydney in the Aboriginal Elders Olympics which was an interesting experience. I had always been told that Aboriginal people were not competitive but I can assure you this group certainly was. Through Mission Australia, I have been teaching English to a number of Students and am proud to say that one of them is now the Student Recruitment Officer at UNSW Business school and another is about to become an Australian citizen. Just last week though Mission Australia notified me that they are no longer funded for providing English support and presented me with a Certificate of Appreciation. I still maintain contact with the some of the young Mums I met at the Come In Centre and have supported them in the various ups and downs of their life. Another area of ministry was the Jesuit Refugee Service in the early stages of the work at Parramatta. Here I was involved in visiting some of the families and came into contact with people from Pakistan, Mongolia, Iraq and Afghanistan, some still waiting for processing, others in need of practical support such as food, bedding etc. Those areas have been my more formal ministry but the informal takes place at places like the Miller’s Point Community Centre, the Fortissimo Choir, and the Pyrmont Scrabble group when people ask me to pray for them or when I try to include them in a group or provide a listening ear. People with whom I have been associated over the years ring from time to time if a crisis has occurred in the family such as a suicide, the onset of dementia, loss of work or a serious illness. These experiences throw them into the suffering and death experience of Christ and they need someone to listen and give them hope. Being the age I am, ministry also occurs when I go to anniversary celebrations of groups with whom I have been involved such as the 30th anniversary of SPRED, Toowoomba, the 10th anniversary of the death of Bishop Murphy, the first Bishop of Broken Bay with whom I worked at that time. It is a great joy on such occasions to see that the seed planted, so many years ago have bloomed. One unexpected event I went to recently was the Opening School Mass at Eltham. My presence there brought back memories, as I had actually been the first person to move into the convent there. 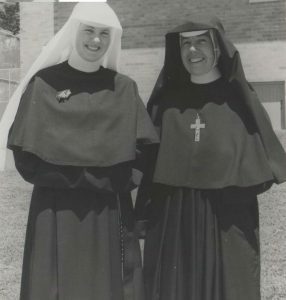 I was teaching at Diamond Creek at the time and we were travelling from the hospital each day but as soon as the convent became habitable Srs Marie Doyle, Everard, Rosina and I moved in. Each night we took delivery of the cases and boxes from CLC and transferred them to the rooms. I realised at this event that I am possibly a “keeper of memories” as I think that Sr Eileen Duffy might be the only Sister from the original group who is still alive. Another area of ministry surfacing at this time of wisdom is assisting friends and associates as they move from independent living to Aged Care. I have tried to be “with them” during this difficult transition and have sat with them as they decide what to keep and what to give away. Unfortunately though, as they tell me the memories that their treasures have for them, they often want to give them to me, which is going to make my transition to Aged Care in the not too distant future even more difficult. I also have incidental ministry in the parish and have been conducting the Liturgy of the Word with Communion once a month but as my legs get more wobbly I have just resigned from that ministry as I could envision myself falling down the stairs with the ciborium in my hand which would not be a very inspiring experience for others. I do have some contact with a few parishioners who have expressed the need. I attend Spirituality in the Pub in the local area and the presentation of the topics by people, who have different life experiences, is very enriching. As you can see from this I do not “have” a ministry, but each day ministry finds me in some way. If it doesn’t, I have books to read, letters to write, and crosswords to do. There was a possibility of a placement with a circus next term but I think my days on the tightrope are coming to an end and beside my working with children card will soon expire. I will help out at St Francis school though when the lift is installed!